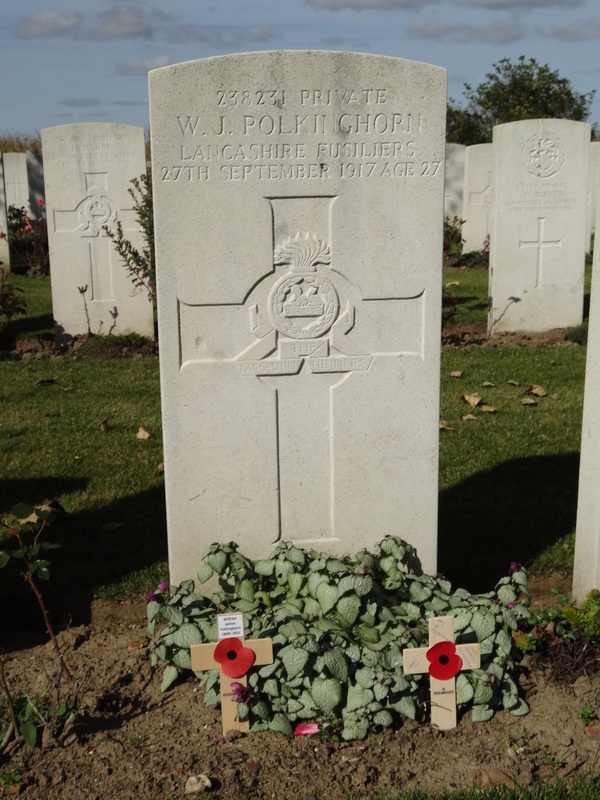 238231 Private William J. Polkinghorn 23rd Battalion, the Lancashire Fusiliers was killed in action 27 September 1918 and is buried at Trois Arbres Cemetery, Steenwerck. He was 27 years old and is commemorated on West Auckland War Memorial. In 1891, 35 year old William born in Cornwall and his 36 year old wife Hannah born in Devon lived at the Batts, Bishop Auckland where William worked as a coal miner. By 1901, the family lived at the Square, St. Helen’s Auckland where 43 year old William worked as a coal miner (hewer). By 1911, the family lived at Whitwell Terrace, St. Helen’s. Only Eliza, Edith and Caroline were at home. William James aged 21 was a visitor to James and Isabel Morris, Cross Street, Scotswood, Newcastle-upon-Tyne. He is recorded ad a coal miner (putter). Isabel’s sister 19 year old Margaret Ellen Foster also lived there. In 1911, William J. Polkinghorn married Margaret E. Foster at Newcastle-upon-Tyne. At a later date, Margaret Polkinghorn lived at 8 Staith Terrace, Derwenthaugh, Swalwell. The following 2 battles are known as the Battle of the Lys. Following a most trying time on the Somme and the Lys battlefields, the Division was withdrawn and sent to IX Corps then on the Aisne, believed to be a much quieter area. Unfortunately this was not the case and the Division was hit hard by another German attack. The service details of Private W.J. Polkinghorn have not been traced. 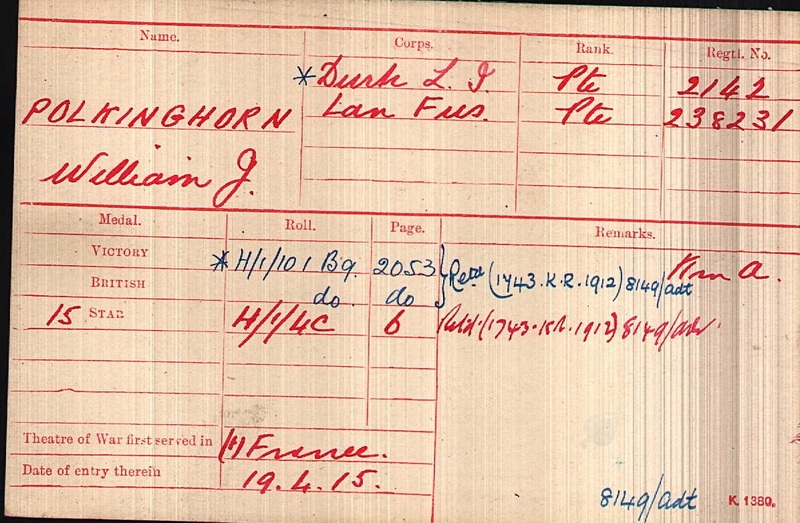 He entered France 19 April 1915 therefore it seems that he went with 6/DLI and the 50th Division. Private W.J. Polkinghorn was transferred to 1/5th DLI (service number 7402), 1/7th DLI (7402) the Labour corps (409042) and finally to the 23rd Battalion, the Lancashire Fusiliers, regimental number 238231. However, the dates he was transferred are unknown. He was killed in action 27 September 1918. The Final Advance in Flanders commenced 28 September 1918 with the Battle of Ypres. The 40th Division was part of the XV Corps, Second Army. British infantry assembled in heavy rain on 27 September and attacked behind a fierce protective artillery barrage before light at 5.20am, the following morning. Despite the difficult ground rapid progress was made. The 23/Lancashire Fusiliers War Diary for the month of September 1918 and the Regimental History have not been researched therefore the circumstances of his death remain unknown. Private W.J. Polkinghorn is buried at grave reference II.Q.4 Trois Arbres Cemetery, Steenwerck. After the Armistice, over 700 graves were brought into it from the battlefields of Steenwerck, Nieppe, Bailleul and Neuve-Eglise. There are now 1,704 Commonwealth servicemen of WW1 buried or commemorated in the cemetery. Commonwealth War Graves Commission Note: CWGC records the date of death as 27/09/1917 but the Grave Registration Form has 27/09/18 typed and 17 hand-written in ink over it. SDGW records his death as 27/09/18.